I’m going to try and get back into a routine of doing a couple of updates a week, which means I’ve actually got to be doing something to update. Project Apollo: this baby is back rolling again after me and Owen sat down and thrashed through some of the issues we had. I would be much further along in this if I had not lost almost three weeks because of that dental issue. 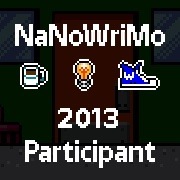 So I’m not going to be done by the start of NaNoWriMo. I’m not entirely sure how I’m going to keep cracking on with Apollo whilst NaNoWriMo is running but I’ll suss it out as I go. I’m thinking it’ll be nice to have to the two because if I’m stuck with one then I’ve got something that is very active in my mind that I can switch to. Apollo and what I’m working on for NaNoWriMo are two very different stories so I think it’ll be a good change of pace for my brain.